The former Marco Polo restaurant in Vienna went up in flames Sunday afternoon. A fire broke out in the vacant building at 245 Maple Avenue W. shortly before 2 p.m. A second alarm was sounded as firefighters worked for around an hour to get the blaze under control. Firefighters from around Fairfax County and as far away as Arlington battled the flames. The Vienna Volunteer Fire Department also assisted at the scene. 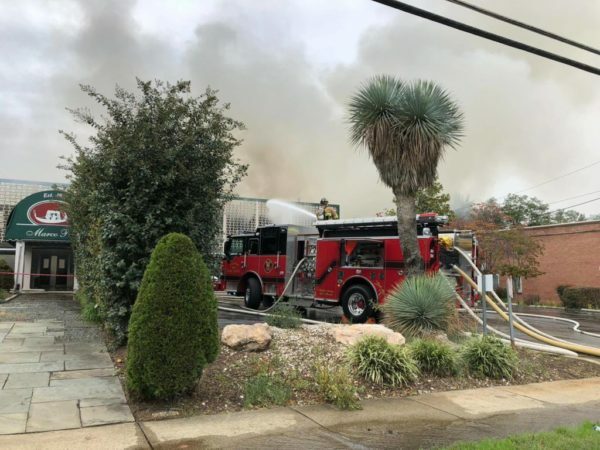 Photos posted online show firefighters using ladder trucks and water cannons as heavy smoke billowed from the restaurant’s roof. It’s unclear what caused the fire as the building was reportedly vacant. No injuries were reported. The building has been discussed as a possible site for redevelopment, though thus far no solid plans have been revealed.